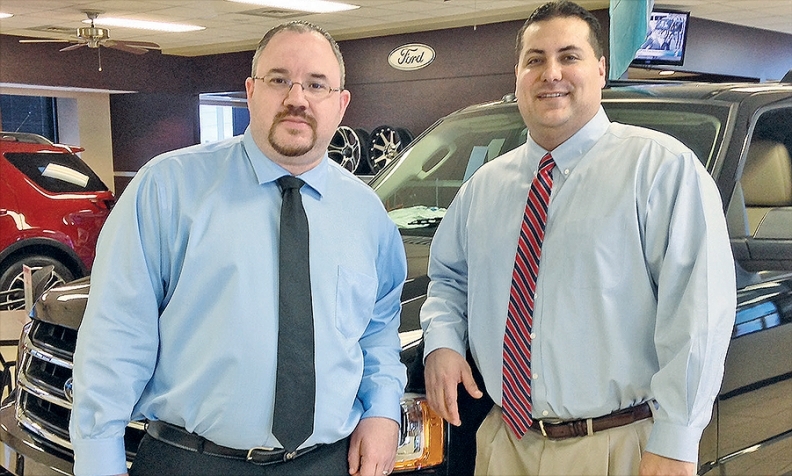 Dealership managers Chris Gottselig, left, and Austin Salinas knew Friendly Ford of Crosby had to make dramatic changes to hold its own in the ultracompetitive Houston market. Friendly Ford of Crosby's new Gen Y-friendly sales and F&I processes have resulted in happier customers and higher new-car sales and F&I profits. • Pricing is transparent, and nearly all deals are passed to customers at lender's buy rate. • Sales of F&I products, especially extended service contracts, are strongly emphasized. • Kiosk scans driver's licenses for faster data entry, with no mistakes. • F&I director, 2 sales managers work deals together at same desk. • F&I officers have 10 minutes after vehicle selection to get customer in their office to finish deal. B.T. Patten, left, a Friendly Ford sales associate, scans a customer's driver's license at a kiosk. The scanner eliminates data-entry errors and helps trim total transaction time. Dealership managers Austin Salinas and Chris Gottselig know how to sell to Gen Y. That's because they fall into that category themselves. The two developed a speedier, more transparent vehicle sales and finance process at Friendly Ford of Crosby, near Houston, that's boosting the store's profits and reputation. "The main thing I look at is time," said Gottselig, 35, Friendly Ford's finance director. "When I purchase something, I want to be in and out as quickly as possible. We adapted that philosophy to a car dealership." Friendly Ford, where six of nine managers are aged 35 and under, began doing things differently in January 2014. The dealership cut by half the time it takes to get a customer into the F&I office and tweaked the finance process, including taking a flat fee instead of a dealer reserve on most deals. The goals were to raise the dealership's poor customer satisfaction scores, boost bland Google reviews and lift sales. Sales of new vehicles shot up by 54 percent in 2014 vs. the previous year. F&I gross profit per vehicle increased $600, and customers are financing with the dealership's lending partners more often. Sales of F&I products rose, too, as did customer satisfaction scores. And, as of last week, the dealership rated 4.8 out of five stars after 121 Google reviews. "Transparency and fast transaction time: Gen Y wants this stuff," said Salinas, 34, Friendly Ford's general sales manager. "They want it now." Crosby, Texas, is a small town about a 25-minute drive east of downtown Houston. The family-owned Friendly Ford of Crosby sells about 1,700 new and used vehicles a year. It competes with ultracompetitive, high-volume dealerships in the Houston market, many of which, Salinas said, are owned by large dealership groups. Friendly Ford had to make dramatic changes to hold its own. "For someone to drive all the way out to Crosby, they want to make sure the vehicle is here, know what the price is and make sure we're not going to play any games with interest rates," Salinas said. So the dealership has made transparency a priority. Most of its customers, especially those born roughly between 1980 and 1995, typically called Generation Y or millennials, have thoroughly researched prices and shopped interest rates, Salinas said. "There are some dealers who don't want to talk interest rates and will say, 'That'll be handled in finance.' We tell them everything they need to know before they go into the finance office," Salinas said. "The second we give them any false information, our credibility is shot." To make transparency possible and build credibility, it meant tying the sales and F&I processes more closely together, Salinas said. But credibility wasn't the only goal, he said; he also wanted the process to be faster. So he implemented several processes to speed up the time it takes for a customer to get into the F&I office. 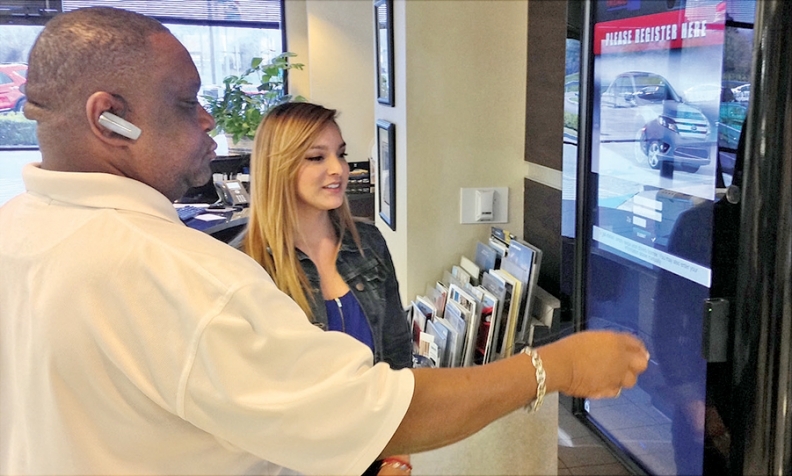 First, the dealership added a kiosk with a driver's license scanner, which eliminates data-entry errors. "It's one swipe of the license, and all the information is in the [database]," Salinas said. "Before, the older guys would hunt and peck and make mistakes when entering the customer's data." Accurate and fast data entry early in the transaction process shaves about 15 minutes off a customer's total transaction time, he said. It also helps the F&I office process paperwork faster. Next, Gottselig, the F&I director, and two sales managers moved in together. The three men share one desk, sitting side by side all day, every day. The arrangement ensures that every deal gets worked at the correct terms, resulting in better teamwork and happy customers, Salinas said. "It assures that everyone is on the same page because nothing kills a deal faster than a salesperson going back and forth to get a deal, then the F&I office says it was calculated wrong," he said. The desk-sharing arrangement also speeds up the time it takes to get customers into the F&I office. As soon as a customer commits to a purchase, the sales manager passes the deal down the desk to Gottselig, who contacts lenders, gets financing approved and takes the deal jacket to one of the dealership's two F&I officers, who then sits down with the customer to pitch F&I products and have the documents signed. While Gottselig is doing his work, one of the sales managers gathers other documents important to the deal, such as insurance cards and manufacturer rebates. "In most traditional stores," Gottselig said, "it takes the sales desk manager about 20 minutes to gather the information for the deal, and then, by the time it gets to the finance manager to submit it to a lender and get a deal together, that is another 20 minutes. That's 40 minutes. We've cut that time in half." To trim time further, once Gottselig hands the completed paperwork to an F&I officer, a 10-minute rule kicks in, Salinas said. That means the F&I officer has 10 minutes to get the customer into his office to pitch F&I products and finish the deal. "We saw several deals fall apart because people got sick of waiting," Salinas said. No customer waits anymore, he said. Every manager in sales and finance is cross-trained. If the two F&I officers are busy with customers and another customer's 10-minute wait time is running out, Salinas, Gottselig or one of the sales managers will go into a spare office with the customer to finish the F&I process and sign all the paperwork. When customers enter the F&I office, the store's focus shifts to selling that customer ancillary F&I products, the main source of Friendly Ford's F&I profit. The result is that F&I product sales rose 15 percent in 2014 vs. 2013, with extended service contracts accounting for most of the gain. Friendly Ford rarely takes a dealer reserve, Salinas said. Dealer reserve, often called dealer markup, is a percentage of interest that most dealerships add to a lender's buy rate on a car customer's auto loan as compensation for arranging the loan. The reserve is usually capped at 2 or 3 percentage points, but customers often don't know they're being charged more than the buy rate. Many dealerships make a substantial portion of their F&I profit from dealer reserve, but not Friendly Ford. "Our focus is on product sales," Salinas said. "We're going to pass along the buy rate to the customer and take the flat [compensation fee] from the bank." Keeping interest rates low and transparent has resulted in more customers opting to use Friendly Ford's lending partners, instead of paying cash or using their own lender, Salinas said. And, he said, the store has had to pay fewer chargebacks -- that is, repay any commissions it had received on a loan that later was refinanced with another lender or ended in default. Before all the changes, it would take about two hours from the time a customer committed to a vehicle purchase to the time he or she completed the transaction. It presently averages about 45 minutes to an hour, Salinas said. He credits the speed and transparency for much of a 54 percent gain in new-vehicle sales last year vs. 2013. The customer reviews on Google are largely positive, which Salinas said is also driving sales. "We put a lot of stock in those Google reviews because we hear about them every day in the showroom," he said. Finally, customer satisfaction scores shot up to the 88th percentile after previously hovering between the 75th and 80th percentiles, Salinas said. "Everybody's on board with the program," he said. "It not only frees up the customer's time but the salesperson's time as well." Gottselig added: "And there is no animosity between sales and F&I. There's usually this idea: 'Will F&I accept my deal?' It's no longer done like that."